Summer is usually the peak season for Grovetown Real Estate purchases since most families want to get settled into their new home by the time the new school year starts. We usually see most relocation’s into the area during this time with military PCS’ing to Fort Gordon or those transferring jobs to companies and medical facilities in Augusta and the surrounding area. Canterbury Farms was the clear winner with the most homes sold over the summer months. This continues to be a popular neighborhood especially with the addition of 2 new sections featuring affordable homes. 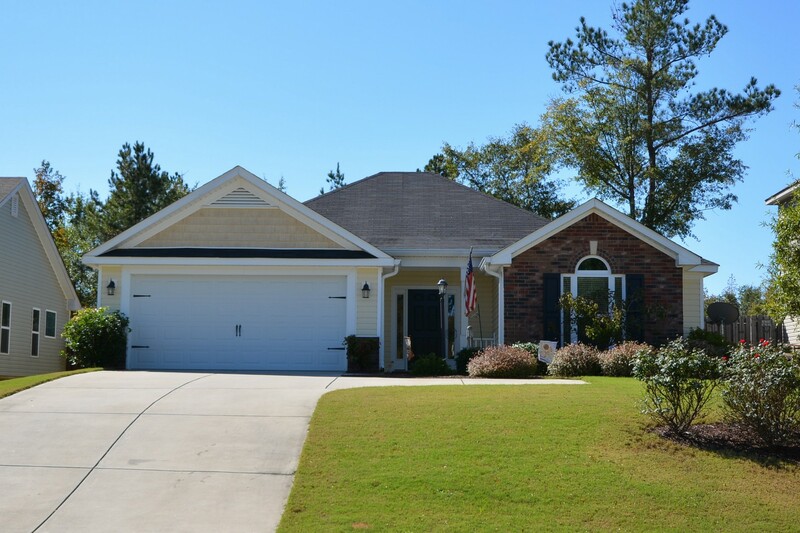 Grovetown continues to remain a popular place for new homes in the area and is an easy drive to Fort Gordon and easy access to I-20 towards Downtown Augusta. For information on homes for sale in Grovetown or Augusta Real Estate, please contact me. While compiling data for the CMA on the home that we have for sale in the Euchee Creek subdivision, I decided to take a look at that entire Grovetown neighborhood just to see how values and sales are holding up in the neighborhood. I am shocked at how quickly the market has slowed down in this neighborhood! Euchee Creek was originally a subdivision with different builders constructing homes around 2000. The concept was to build moderately priced all-brick homes with prices around $100,000. Somewhere between 2002 & 2003, Bill Beazley took over the development and began marketing it exclusively as a Beazley neighborhood. Construction in Euchee Creek ranges from 1-story ranch style homes to 2-story traditional style that was introduced as the new homes construction market changed in the area in late 2009. This was during the time that Pillon’s company or Crown Communities came in the Augusta area and changed the style and pricing of new homes available in residential real estate. Here is a break down of the market dynamics for both new construction homes and resale homes for Euchee Creek in Grovetown, GA. In looking at the New Construction table above, the sweet spot for number of sales was in 2004 when Euchee Creek was booming. You had brick homes, mostly with 4 bedrooms and 2 baths, for a median price of $135,900 and the appeal of being only 5 miles from Fort Gordon making this neighborhood a popular choice for military buyers. From 2000 through 2005, new homes in Euchee Creek increased in price by 6% on average. The biggest jump in price was in 2006 when the price increase was double at almost 12%. After that bubble burst, prices started declining and even price reductions by at least 3% in 2008 and almost 4% in 2010 while building larger homes. Prices went down and square footage went up! 2008 brought the Banking Crisis later that year, but as you can see the market was all ready declining by the fewer new homes that sold during that time. In 2009, Euchee Creek was getting towards the final phase of construction with only 20 or so lots remaining for Beazley to build homes on. This was also the same year that Crown came into the area with a totally different product at an affordable price gobbling up market share in the new homes market. Earlier this year (2011), the last 2 houses sold in Euchee Creek. These 2 homes are different from anything else in the neighborhood, but Beazley had to change his home designs to stay in the game. The height of the resale market in Euchee Creek was during 2007 and 2008. As you can see from the table above, pricing did not stay the same even though the same number of homes sold during those 2 years. This means that 2007 was the sweet spot since resale homes sold for the highest amount. There was a $4,000 price decrease in 2008 with price continuing to drop since that time. There are 2 big reasons for this: 1) Foreclosures and 2) New Home/Builder Competition. Those that bought new homes at the lowest price back in 2002 and 2003 have enough equity in the property to compete with the lower prices from both the foreclosed properties and builder incentives. The Euchee Creek resale market mimicked the new homes pricing increases all the way through 2006 with that huge increase of just over 11% and then another 3% in 2007, which means these sellers in 2007 hit the market just right to make the biggest profit from their homes. Things started to slide in 2008 with market value losing 2% and then stabilizing with 0% in 2009. Once foreclosures and those new larger, lower priced homes started hitting the market prices declined again by 7% in market value during 2010. So far in 2011, there is a decrease of about 5% on resale homes in Euchee Creek. This is a “Perfect Storm” (if you want to call it that) for those that bought in 2006 at the height of the market the are hitting that 5 year period when they should be able to sell without losing money….well, they are being hit the hardest in the equity wallet cause they bought high and will have to sell low. Which just down right stinks! Now, what does all of this mean for those of us that bought homes in Euchee Creek? Well, one good thing is that construction is complete and those looking to sell will not have to compete with the builder inside of the neighborhood. Bad news is we still have to compete with new homes and builders in newer neighborhoods plus foreclosures in Grovetown and Columbia County. Do not sell your home right now! If you must move, then rent your house. If you are in trouble, please don’t walk away from the home without attempting to negotiate a short sale with your lender. If you need information about a short sale please contact me, I can help. If you would like a current market analysis, please email me or see my Free Augusta Home Value Estimate page. May is graduation time here in Grovetown and this year Grovetown High School graduated the 2nd class from this new high school. This also marks the start to summer, which is the beginning of “moving” season. Please note I am now using the “median” price versus “average” price on the statistics because something looked very off on the reports. This is probably best to do since the median doesn’t use the highest or lowest price. I will continue to use the average days on market, because I think the time it takes to sell a house is very important. We all need to know if it took 2 years or even 1 day to sell a property. Canterbury Farms over took High Meadows this month for the lead on number of homes sold in a subdivision. Canterbury Farms in the 4CO area had 12 Homes that sold. This subdivision has recently expanded with two new sections and looks to continue to grow in the future. JR Homes, Ivey Residential and Winchester Home Builders are currently building in Canterbury Farms. High Meadows in the 2CO area finished up May with 9 Sold Homes. This neighborhood has limited lots left to build with a few basement lots remaining. If you are interested in any of these homes or if you are needing an in depth market analysis of your neighborhood, please contact me.